The Japanese government has decided to simplify visa regime for Georgian citizens, Minister of Foreign Affairs of Japan Taro Kono stated on Tuesday during his visit to Georgia. He said that the simplified procedures would further deepen ties between Georgia and Japan. The detailed information regarding the simplification is expected to be announced shortly. “We share fundamental values such as freedom, democracy, human rights and the rule of law. Last year Georgia and Japan celebrated the 25th anniversary of the establishment of diplomatic relations. I am happy and satisfied with good relations between our countries,” Kono said. Kono announced that a political agreement has been reached on a bilateral investment agreement between Georgia and Japan. “We have exchanged notes on the improvement of the East-West Expressway [of Georgia]. I think this project will promote the development of logistics. Caucasus region is the door, which unites Asia and Europe and the Middle East. “Stability in the Caucasus is not only a matter of regional importance but an important factor for the peace and security of the international community. Japan wants to deepen cooperation with the Caucasus region through the concept of the Caucasian Initiative. This initiative consists of two main elements: supporting the development of human resources and state building and supporting the improvement of infrastructure and business environment,” Kono stated. Georgian President Giorgi Margvelashvili called historical to Kono’s visit, highlighting its positive impact on friendly ties and cooperation between Georgia and Japan. 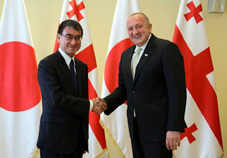 The meeting between Margvelashvili and Kono was focused on the economic cooperation between Georgia and Japan. At the meeting the officials noted that the Japanese Government, through the International Cooperation Agency, will allocate financial resources to Georgia that will be used for the construction of the East-West highway, President’s administration reported. Margvelashvili said that intensification of high-level visits encourages the Japanese business sector to view Georgia as an attractive investment destination. While discussing the issues related to Georgia’s occupied territories, President Margvelashvili thanked Kono for supporting Georgia’s sovereignty, territorial integrity, European and Euro-Atlantic aspirations.